The next-generation online html editor is now available! Rich Text Editor for asp.net is by far the fastest, cleanest, most powerful online wysiwyg content editor. It's also available for PHP and ASP. 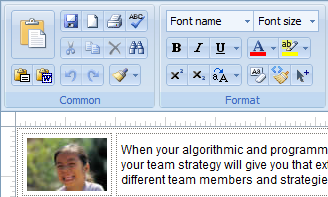 It enables asp.net web developers to replace any textbox/textarea with an intuitive word-like wysiwyg editor. Rich Text Editor toolbar is completely configurable and it is also effortless to implement. You just need a couple lines of code to add this editor to .NET and MVC applications. Rich Text Editor is the industry-leading online html editor and we are proud that Rich Text Editor always serves as an inspiration for other editors. Now version 8.0 is designed from a different point of view from old versions and most editors. Most available RTEs fail to support the full spectrum of A-Grade web browsers. Following 9 year old tradition of industry #1 cross-browser support, Rich Text Editor continues to offer even better quality and compatibility by supporting all major browsers: IE 6.0+, Firefox 2.0+, Mozilla 1.3+, Netscape 7+, Safari (1.3+), Opera 9.0, IE 11 and Chrome. From powerful online image management, easy to use file manager, to multiple image uploading, to online image editing, to PDF conversation, Rich Text Editor has developed into a robust, full-featured suite packed with advanced technology. Fully compatible with latest MS Office files so users simply copy & paste desired contents into editor without losing any style or format of the contents. The Rich Text Editor team is pleased to announce that the long-awaited version 8.2 has been released. Registered users can take advantage of all the new features by upgrading. Click here to check the upgrade information. CuteSoft Components Inc. is a privately held company incorporated in Canada, specializing in powerful, elegant and beautiful, web based softwares. We've been in online Rich Text Editing development for over 9 years and love the daily challenges of solving real problems in the simplest way possible.